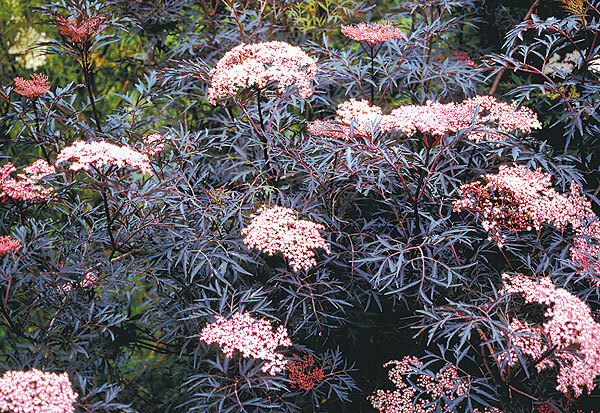 'Black Lace' quickly grows into a shrub 6 feet tall and wide. Produces lemon-scented, 6-inch-diameter pink flower clusters in spring and bunches of blackish red berries in summer. The real eye-catcher is the fern-like, lacey black foliage. The rich, chocolate color holds throughout the summer. Black Lace gives a striking appearance when grown as a specimen shrub in the landscape, but the berries are attractive to birds, making it an excellent wildlife plant. USDA zones 4 to 7 and grows best in full sun on well-drained soil.